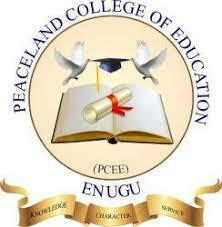 Peaceland College of Education Enugu Diploma and Certificate Programme Admission Form, Admission Requirements, Application Guidelines for 2018/2019 Academic Session. Applications are invited from suitably qualified candidates for admission into the Peaceland College of Education, Enugu Diploma and Certificates Programmes for 2018/2019 academic session. SEE ALSO: Peaceland College of Education NCE & Degree Admission Form 2018/19. Forms are available at Peaceland for N3000 only. For Further Enquiries, Visit Peaceland College of Health Technology Campus or Call Ada on 07053736901. We are Peaceland, We set the Pace!